The popular resort, Fethiye 135 km southeast of Marmaris boasts an important marina at the head of a beautiful bay strewn with islands. Above the town, (called Telmessos in antiquity), numerous Lycian rock tombs, reproducing the facade's of ancient buildings, were cut into the cliff face. The Tomb of Amyntas, which probably dates from the fourth century B.C., is the most remarkable. The road to Belcegiz Bay takes you through the mountains, where cozy guest houses cater to those seeking mountain scenery. Ocakkoy is a mountain village must. Stay in one of the lovely guest houses and enjoy the numerous hiking possibilities. Hisaronu, also in the mountains, has very nice hotels. Kayakoy, four km from Hisaronu, is a picturesque ghost town of old houses and churches. Explore the bay and the beautiful Blue Lagoon (Oludeniz) where the calm, crystal clear water is ideal for swimming and other water sports. The Blue Lagoon is one of the best places in the world to do absolutely nothing but soak up the sun amid stunning natural surroundings. From Mt. Baba (1,969 m), you can paraglide into the Blue Lagoon. For those seeking accommodations, Belcegiz beach is highly recommended. Intoxicating scenery surrounds the beach and shady park at Kidirak. On Gemiler Island (St. Nicholas Island), Byzantine ruins are tucked amid the pines. South of Kidirak beach, Koturumsu Bay is reachable only by boat. Beyond the idyllic beach, a forest, waterfalls and a valley filled with hundreds of varieties of butterflies await the intrepid explorer. High in the mountains above Fethiye a rushing torrent cuts a narrow gorge through the mountains, creating Saklikent (Hidden City) Canyon 44 km south of Fethiye. A cool refuge on hot summer days, Saklikent is a favorite picnic spot, with rustic restaurants serving delectable fresh trout. Yakakoy (Tlos) 36 km south of Fethiye, is the oldest city in the Lycian region and the home of the Lycian Hero Bellerophon. Visitors can see the remains of a castle, the agora, the necropolis, the theatre, Roman baths and a good view of Esen Valley. Two km east is Tlos Park, a terrific picnic spot. Pinara, 49 km south of Fethiye, is another ancient mountain city,popular for hikers who can see the remains of a theatre, an agora, a rock tomb, and baths. is a pretty town at the hillsides of the Mount Mendos, the part of the Taurus Mountain chains, and surrounds the bay that it has given its name to. The high mountain range formed by rises and falls of the crust during the Tertiary Geological Period, and hundreds of bays lying at the mountainside seem to embrace each other along the Fethiye shore line. This mountain range (it was called the Kragos and Antikragos in the antique period) with an altitude of more than 6560 feet (2000m.) forms the southwest end of the Toros (Taurus) chain and lies parallel to the shore without a single passage to the inner regions. On a warm and sunny winter day, peculiar to the Mediterranean climate while you are sipping at your Turkish tea or Turkish coffee, at one of the local tea gardens, along the coast, these mountains with pine trees at their skirts, white snow and mist on their summits will once more welcome you to heaven. Dry, long, hot summers and short, warm, rainy winters are climatic characteristics of Fethiye . The temperature which is around 86-105 F (30-40 C) during the summer, is usually above 50 F (10 C) in the winter. Considering the fact that in these turquoise-colored seas that in no season falls below 60 F (16 C) swimming is possible for nine months of the year, we might as well conclude that there are only two seasons in Fethiye : Spring and Summer! Due to the prevailing climatic conditions in the region, pine forests consisting of silver fir, Scotch fir, and Norway spruce cover the place. Olive, laurel, myrtle, acacia, plane tree, and popular trees are some other types that you can find in this rich flora. the frankincense tree (Liquidamber Orientalis) which is the source of myrrh widely used in the pharmaceutical and cosmetics industries, is among the rare species in the world. This plant has survived for 10 million years and has remained in existence since before the ice ages is cultivated only around Fethiye and Koycegiz and in a small district of California. You may reach this natural and historical heaven that God has donated to nature by any of one of the land, air, or sea courses that you chose. You could have a comfortable journey to Fethiye by the three highways through the pine forests, with connections to Mugla, Antalya and Burdur. Scheduled bus trips in all three directions provide the link between Fethiye and other cities. The nearest center for air travel is the Dalaman Airport 31 miles (50 kms.) to Fethiye. In addition to the year round Istanbul - Izmir - Ankara and Antalya connected flights of Turkish Airlines, there are direct flights to all major cities in Europe, Asia and America. The naturally protected harbour is a drop-by place for all yacht crews. The secrets of the ancient gods of mythology still lie hidden in the secluded coves and bays around the Gulf of Fethiye. This is truly paradise for those who want to sail through history. Above the town of Fethiye, called Telmessos in antiquity, numerous Lycian rock tombs reproducing the facades of ancient buildings were cut into the cliff face. Explore the Belcegiz Bay and the beautiful Blue Lagoon (Oludeniz), where the calm, crystal-clear water is ideal for swimming and other water sports. On Gemiler Island, Byzantine ruins lie tucked among the pines. Go ashore at Kinik (65 km from Fethiye) where the ruins of Xanthos, the ancient Lycian capital, lie in a splendid natural setting. At the holy Lycian center of Letoon, three temples dedicated to Leto, Apollo and Artemis, familiar gods of mythology, await the intrepid tourist. Mythology records that Apollo was born at Patara, a principal harbor of ancient Lycia, south of Letoon and Xanthos. The ruins are numerous and fascinating. Its 22 kilometers of pure white sand stretch as far as the eye can see, making it a natural choice for all types of beach sports. A short sail to the east brings you lo Kalkan, a small, lovely hilltop town that overlooks a tiny bay. Narrow, winding streets lined with souvenir shops lead down to the charming marina- Every morning, boats busily take tourists lo one of the nearby beaches or small bays. As the sun sets, it is Kalkan style to meet on the roof terraces for a drink before dinner, and enjoy the comings and goings of the yachts, the business of the marina and the panoramic view. 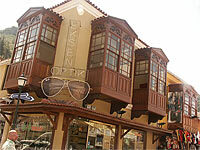 Fethiye is a traditional market town set around a beatiful natural harbour. It is a big centre for scuba diving and boats leave from here for day trips around the stunning coastline. The most popular is the 12 islands boat trip, a relaxing way to spend the day, touring the beatiful coves and islands of the Gulf of Fethiye, with breaks for lunch and swimming. Life here continues all year around, and recentlu, many British nationals have chosen to make this relaxed area their home. There are a number of hotels in the town itself, which mostly attract older couples, who enjoy the traditional lifestyle and also like the fact that it is flat and easy to get around. There is a greater variety of shops in the narrow streets of the bazaar area, Paspatour, offering more competitive prices than those in any of the resorts. In the evenings head for this lively area for live music and Turkish bars. There is no beach in Fethiye itself although there are hotels which have access to the sea for swimming. Once the site of the ancient city of Telmessos, all that remains are the Lycian rock tombs, which overlook the modern town, a couple of Lycian sarcophagi and a small Roman theatre. Ölüdeniz is the archetypal picture-postcard beach, backed by dramatic pine-clad hills, and is the view that you see on many a brochure cover. Literally translated as 'dead sea', the stunning lagoon is a protected area, ensuring that its natural beauty is preserved. There is a small entrance charge to use the lagoon beach and only non-motorised watersports are allowed on the lagoon itself. The main resort beach, which is free entry, is the long stretch of coarse sand and shingle, known as Belcegiz beach. Most of the accommodation, built in the traditional local Mugla style, is set back from the beachfront and in the streets behind. There is a strip alongside the seafront promenade with a number of relaxed bars, restaurants serving local and international cuisine and shops, which stay open well into the night. It is a perfect family resort, great for a laid-back beach holiday, with plenty of facilities but not too much development. Boats leave from the bay for trips around the surrounding coast and paragliding is a big draw with the descent from the Babadag mountains to land on Belcegiz beach, rating as one of the best in the world. Just a short distance from Hisarönü, is the newer resort area of Ovacik, which is essentially a collection of hotels and apartment buildings, blending in with the stunning mountain scenery. It is more peaceful than its neighbour, and all facilities are in the centre of Hisarönü just a short walk or dolmus ride away. Ovacik makes a good base for those who want to walk in the surrounding countryside. The nearest beach to Fethiye is Çalis beach, a pebble and coarse sand beach in a beatiful setting, which can be reached by boat or dolmus from the town center. The seafront promenade with its hotels and restaurants is closed to traffic during the summer, making it safe for children. The resort has expanded around the beach, and has a relaxed feel popular with families and older couples. One of the highlights of a stay in this area is a visit to the eerie ghost town of Kayaköy, literally 'stone village'. Once the Greek town of Karmylassos, it was abandoned in the 1920's. It has recently been the subject of renewed interest as it features as the setting for Louis de Bernières novel, 'Birds without Wings' which provides a fascinating insight into life here and the period of dramatic social change which took place in the time leading up to the foundation of the Republic of Turkey. There are around 400 houses here together with churches and other public buildings. It can be visited by dolmus, on foot from Hisarönü or even on horse-back. Göcek is popular with yacthing types who come here for its excellent marina. It is a charming resort with a range of sophisticated hotels and upmarket restaurants and boutiques. Known in Turkish as the 'hidden city' Saklikent is a stunning mountain gorde some 44 kms from Fethiye, a narrow opening stretching an incredible 18 kms into the rockface of Mount Akdag. A wooden walkway has been constructed above the icy cold waters of the mountain springs of Gökçesu and Ulupinar. If you are feeling particularly brave you can take a dip here, but otherwise the waterside cafes provide a relaxing break and a chance to enjoy the spectacular setting.